← a personal appeal to adults on behalf of young people. 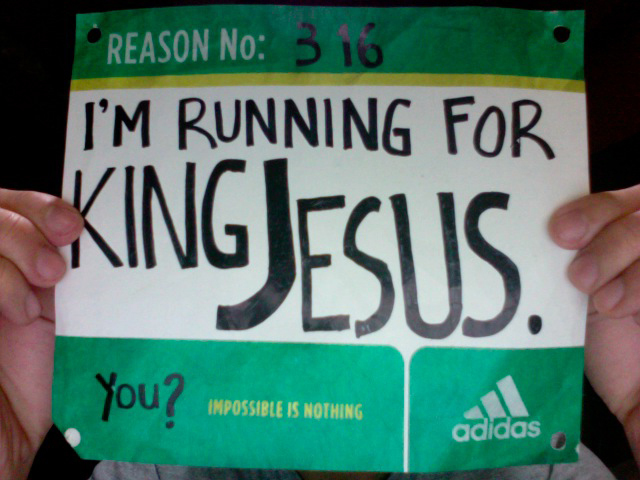 i’m running for King Jesus. you? The last and only time I ran a full marathon was way back in 2006, together with AT. I remember how we encouraged one another to keep the limbs moving, slapped Deep Heat on our legs, consumed those horribly-tasting power fluids, drowned ourselves with 100plus, grunted like a man at every restart and more memorably, how we told each other that we would start and end the marathon together. At the final kilometre, as we caught sight of the end point, we miraculously found strength from I-don’t-know-where and sprinted to the finish line. When we crossed it, our legs never felt that jelly before. It was a defining moment, for sure. Marathons are brotherhood-inducing activities. 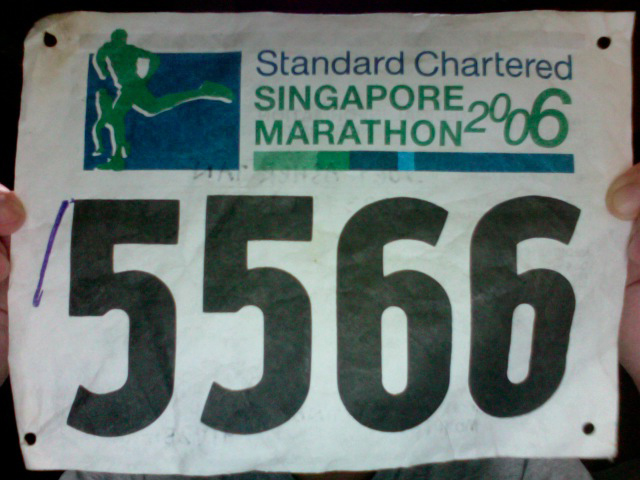 Fast-foward four years, I signed myself up for the Standard Chartered Marathon that will take place on 5th Dec 2010. Registration opened today and I took advantage of the early bird price. (Thanks VY, for posting the link on Facebook – can’t wait to train together!) Yes, another gruelling 42.195km worth of sweat and pain. I look forward to the actual run as much as I look forward to the months of progressively intensive training; I remember how AT and I met at Bishan on a weekday at 7pm, ran to Sembawang and back and covered 27km, did our cool-down at 1130pm, looked at each other and wondered how we we were going to make it to work the next day. It was pure insanity, but it was good. I was so proud of my achievement I kept my finisher’s medal and certificate, as well as my front and back runner’s tag. I also found a picture of myself online running the marathon! I stayed over at AT’s place the night before and I remember designing the back tag. Adidas ran a campaign on your Reason for Running that year and I took a long time to ponder my message before I wrote that on my tag. Honestly, I didn’t know who or what else to run for except for the glory of God. If I was going to have six hours with thousands of other runners, then I might as well do something with it – so I told myself that I was going to run for Jesus, my King. This gesture to please God turned out to be an interesting experience for me. I had Christians of all ages and gender coming up to me to encourage and to affirm me. It was really quite an experience! I’d encourage everyone to consider taking part in a marathon at least once in their lives; I always tell myself it’d be a tale I’d be able to regale to my grandchildren. It’s not about how well we start, or how well we run, but about us finishing it as well. Some people say life is short – but how short is it, really, if it’s all we have as mortal beings? Life on earth is actually pretty long – just about the longest duration of any event that we’ll ever experience! To me, life is a marathon – and I am determined to end it well to receive my medal, certificate, memory as well as a good pat on the back and a voice that will say, “Well done, thou good and faithful servant!” This year, as with every subsequent year from this point forth, I’m going to run for Jesus again. What about you? Posted on May 21, 2010, in A Walk To Remember, Affirming Faithfulness, Extraordinary Mundane, Forever Young, Heart Upon Sleeve, Picture Perfect, Retrospective Reflections, Simple Pleasures and tagged 100plus, Adidas, Adrian Tay, Bishan, brotherhood, certificate, Christian, Deep Heat, encouragement, experience, facebook, finish, glory of God, God, grandchildren, Jesus Christ, life, marathon, medal, memory, runner's tag, running, Sembawang, Standard Chartered Marathon, strength, training, Victor Yen, voice. Bookmark the permalink. Leave a comment.